Today’s New Moon occurred at 5:35 AM EDT. Since I have two planets in Aries, I thought I might spontaneously combust early in the AM before I even got a chance to eat my oatmeal. However, as you can see, I’m still here, posting away! I am a little antsy and feel like running around somewhere instead of sitting at a desk, though. The New Moon period is ideal for setting intentions for whatever you’d like to see manifest during the month. The focus here is on anything in a developing or “seed” state, and the idea of “starting from scratch”. Aries is the Absolute Beginner of the zodiac. Today’s lineup of the Sun, Moon, Mars, Venus and Uranus in Aries Eris, named after the goddess of Dischord, squeezes in there too) blasts us with a cosmic overdose of this cardinal fire sign! 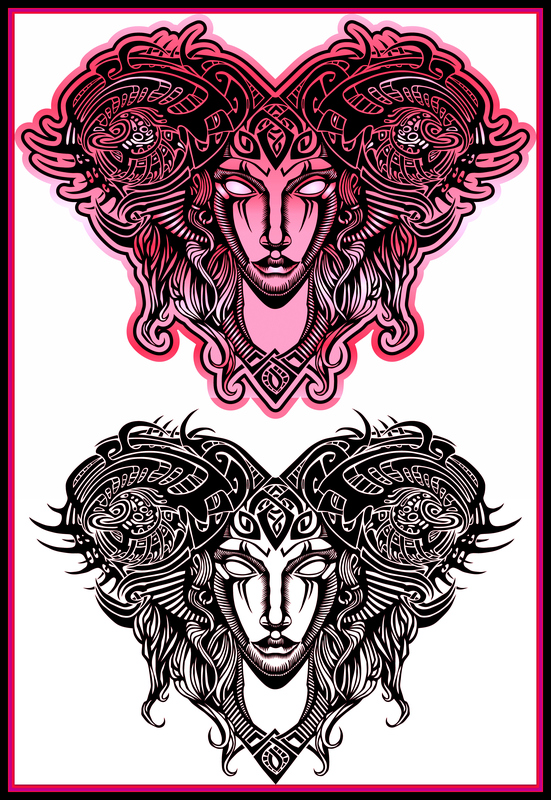 As Aries energy always reminds me of the over-the-top heroes and heroines of Norse mythology, I slapped a double Valkyrie/Freyja image up on top, since the Moon and Venus are both in Aries right now. In ancient Norse myths, the Valkyries were fierce beings who swooped down on battlefields and took half the slain to Odin’s hall and the other half to the goddess Freyja’s field. Freyja, or Freya, is the northern region’s version of Venus (but she’s still pretty fierce, so she’s representing Venus in Aries today). The Valkyries get to be Uranus in Aries as they swoop down like lightning from wherever-the-hell they come from and zap! the field is cleared. Let’s make the warriors Mars in Aries. So everybody’s involved in this battle one way or another. Since Mars is in a power position in Aries, the warriors go out there, fight the good fight, die, and wind up someplace interesting drinking mead with or hanging out with the goddess of love. Direct action, direct results. Not bad. Venus is not as comfortable in Aries, being in its detriment, so we have an interesting dichotomy (hence the 2 faces above). It’s like female warriors trying to fight in the leftover armor of the males. Not quite the right fit, and the armor hampers their natural movement as it wasn’t made for them. So they fight harder or feel like they have to prove themselves more than Venus in other signs. Since the yin and yang are all mixed up together in Aries at this New Moon, it’s about integrating our energies and learning to focus that energy so it’s more effective. With Uranus close to this planetary pileup and fellow chaos traveler Eris in the mix, it can be something totally unexpected that flings us into the inferno; whatever takes us out of our comfort zone will do. Uranus is 2 degrees away from another exact square to Pluto in Capricorn, and as we’ve all noted, the past year or two have seen massive changes and upheavals in the world under the Uranus square Pluto umbrella. Take a look at your own chart and see where 21 Aries is located. Those of you who have planets or chart angles around this degree will feel this New Moon the most, and those with planets/angles around 21 degrees of the other cardinal signs (Cancer, Libra, Capricorn) will also feel the heat. This is the area where you get the chance to make a new start. Be daring, try something new, don’t hold back, because here’s a golden opportunity to make huge strides forward. One interesting thing about this New Moon is that the planetary picture features Saturn in Scorpio as the lead planet in a locomotive-style chart pattern. So Saturn in Scorpio is also providing the energy that’s setting this whole choo-choo down the tracks. Scorpio’s co-ruler is Mars, which is, of course, currently in Aries 2 degrees from the New Moon. So for those of you wondering why this New Moon seems to be not only the Detonator but the Exterminator, say hello to our little friend Saturn in Scorpio! Part of the point of new beginnings is they often occur when it’s too painful for us to stay in our old paradigms. Saturn in Scorpio is quite ruthless in pointing out where we need to tear it all down. Saturn’s currently retrograde, so we’re reviewing and reassessing…kicking the tires, digging at the wood to see if there are termites in the foundation, and shoring things up so they can stand whatever is barreling down the road in our direction. We’re in the middle of a huge cycle of purge and release. All this is reinforced by the impending Pluto retrograde (Friday). Many of us are feeling rumblings from the underground already, in advance of Pluto’s shift. We’re wondering where the bodies are buried –and if there’s hope for resurrection! Since Saturn’s currently in a wide sextile to Pluto in Capricorn, this is an inside job, so we’ve been feeling the stirrings for a while. These two are like those teams of renovation experts you see on all the decorating shows, the ones who love to run around with a sledgehammer smashing up old crap. Then they hand the sledgehammer to the owners and tell them to get to work. The North Node is also in Scorpio, and it’s quincunx to the New Moon action, so we might be a little squeamish about blasting away the past at first, but as the North Node always points to our highest evolutionary path, we’re really being pushed to be authentic, to clear away whatever is preventing us from accessing our core energy. We’re not allowed to hide behind anyone or anything from now on. We need to let go of people or situations that hold us back and ally ourselves with our fellow warriors. Use the Aries New Moon to determine what you really want, and then don’t just think about it, do something to achieve it. It doesn’t have to be anything major, baby steps are OK. Just start something. Both of today’s Symbols feature the Aries theme of fighters, warriors, or those who are engaged in an intense and focused struggle. Even if the struggle is all about that external foe, it’s also always about proving ourselves and dealing with our own internal struggles. We gain strength from pushing ourselves to the limit, by testing ourselves against others or the environment. It requires courage and belief in yourself, Aries traits. The Sabian Symbol shows a fighter at the moment he enters the ring (first moments and anything brand spanking new = Aries). All the action is in the center of the ring, and the fighter is the focus. It’s a symbol of self-assertion and a willingness to fight until the very end–and we’re fighting to win. Prizefighting is not a team sport, but the fighter does need an opponent, so this Symbol directs us to consider how our actions lead to reactions from society or from other people. If you’ve ever seen a fight that lasts many rounds, the keyword makes perfect sense–it requires an intense amount of concentration and physical exertion to remain alert and on your feet when confronted by an opponent who is strong and focused. On the negative side, it can show excessive pride, bullying, or using force or intimidation in order to get what you want. Avoid taking things too far, grandstanding, or starting fights for no reason. The Kozminsky Symbol features another fighter in mid-battle with a nasty dragon-y serpent thing. It requires a great deal of gung-ho to chase around mythical creatures. Fortunately his friends and their big knives (more warriors–good thing there’s a lot of planets in Aries!) are showing up to help rout this monster. This Symbol relates to fighting all the dragons that bedevil us, wherever they come from. This symbol also relates to hidden enemies and aspects of our own inner selves that work against us–“the inside job.” The fierce group of friends reminds us to attract the best and brightest, people who “have our back”, and to leave behind negative elements and associations. We can achieve a great deal by working with those who have the same goals. As noted in the astrology section, it’s time to step up, take action, and root out the obstacles that keep us from operating at our highest level. The Ace of Pentacles shows the seed moment when the life force within begins to push forth, demanding to exist in the world. This is one of the themes of today’s Aries New Moon. This is the moment it all begins. Here’s where we seize the opportunity, take the chance, and create the proper environment for growth. There’s a future orientation, it’s all about possibility and the excitement of new beginnings, which is 100% Aries. The Pentacles are Earth cards, and as the Moon progresses into Taurus mid-day, our theme is to nurture and encourage the ideas and plans that were sparked into being at this New Moon with all those planets in firebrand sign Aries. The 6 of Swords tells us that in order for us to grow, we need to leave familiar shores. We know what we need to do, we’ve made that difficult decision, but it’s still not easy, no matter how excited we are about future possibilities. We may have to leave behind what we thought was safe and secure. We’re looking at things from a new perspective based on past experiences. As it relates to the New Moon, we may find that whatever comes into our lives now somehow severs us from established people, places or situations.